He accomplished what no other pitcher had done — came straight off the prep diamonds and hurled a major-league shutout. Fresh out of Chester (Pennsylvania) High, 18-year-old Lew Krausse strode to the mound on June 16, 1961, before the largest single-game crowd of the season up to that point in Kansas City’s Municipal Stadium to take on the expansion Los Angeles Angels. Over the course of 32 batters, Krausse encountered one hitter — Ted Kluszewski — more than twice his age in his three-hit shutout. But a handful of less spectacular outings soon relegated Krausse to the bullpen and eventually to the minors, where, except for a few late-season call-ups to Kansas City, he remained for the next four years. When he returned, Krausse carved out a pedestrian 12-year major-league career. But on that one day in the summer of 1961, he had the attention of the entire baseball world. Lewis Bernard Krausse Jr. was born on April 25, 1943, to Lew Krausse and his wife, Lillian, in the Philadelphia suburb of Media, Pennsylvania. Under the tutelage of his father, a former pitcher with the Philadelphia Athletics and then a scout for the Kansas City A’s, Lewdrew nationwide attention with 18 no-hitters in amateur play. 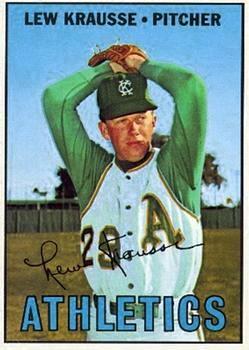 There were bids for his services, but Krausse Sr.’s connection to the Athletics essentially eliminated the competition, and within hours of Lew’s graduation from Chester High School in 1961, father was inking son on behalf of the Kansas City franchise. For baseball, that summer was dubbed the Silly Season.i An estimated $10 million in bonus payments went to a large number of projected phenoms including Bob Bailey ($175,000), Bill Freehan ($150,000), and Wade Blasingame ($100,000). Lew and his scout/father were not isolated from this gusher of cash. Even with Kansas City’s inside track, bidding from rival clubs forced the Athletics and new owner Charlie Finley to dole out $125,000 to secure the young righty. Lew’s contract stipulated that he be given a chance to pitch for the parent club, opening the door to the June 16 outing. This stipulation was not a high threshold. The franchise had not captured a pennant since Lew Sr. hurled for them 30 years earlier, when the team was the Philadelphia Athletics, and had managed only five winning campaigns since. The 1961 club was well on its way to the franchise’s 13th 100-loss season (it has tacked on three more through 2012), and a team ERA of 4.74, the worst in the American League, would seemingly invite help from any quarter. Lew followed in the footsteps of teammate Jerry Walker, who four years before had made the same leap from high school to the big leagues. Although Lew attracted large crowds each time he took the mound – in a moment of frankness discussing the $125,000 bonus, Finley admitted, “[w]e packed the park the first four times [Lew] pitched for us and probably got our money back”ii — Krausse’s subsequent appearances weren’t nearly as successful, and he spent most of the next four years toiling in the minors. The reason was control. In 55?innings Krausse walked 46 batters, and it was deemed that a stay in the minors would correct this deficiency. After an impressive winter campaign in the Florida Instructional League, where his father coached, Krausse reported to the Binghamton Triplets in 1962. If the youngster was lacking in control, he more than made up for it in confidence as he brashly predicted a 20-win season in the Eastern League. That same confidence was reflected in the consensus of “executives, scouts and managers [who] agreed that if [Krausse] does not win 20 games … it will probably be because the A’s [promote him] before he can hit the mark.”iii It was injury, not promotion, that prevented this mark. Krausse’s debut in the minors was spectacular: a 16-strikeout performance against Elmira. An ailing elbow developed and Krausse was shut down in July, and was now looking at a possible early end to his career. “A final examination on November 13 will determine whether Lew … will ever hurl again,” said his father,iv and the youngster was sent to Mayo Clinic for evaluation (where one of his fellow patients was Charlie Finley). Surgery was necessary. That was followed by a jump to Triple-A Portland (Pacific Coast League), where it took time for Krausse to acclimate to his newly repaired elbow and his new surroundings. After a rough beginning, a second-half surge produced a team-leading 13 wins and, more importantly, improved control. Continued progress led to late-season call-ups in each of the next two years. After the 1965 season Krausse had been sent to the Venezuelan winter league, and he produced a dazzling performance. He came within one hit of a perfect game, then a week later hurled another one-hitter while setting league records for strikeouts in a game (21) and consecutive strikeouts (10). The A’s couldn’t help but notice: “[Krausse] has finally reached the point where he has assimilated all of the instructions he has received,” said general manager Ed Lopat. “He has shown a lot more maturity … [and] has a chance to be an outstanding pitcher.”vi Manager Al Dark went even further: “[Krausse] can win [in the big leagues] … [h]is curve is exceptional. He reminds me a lot of [Dodger great] Carl Erskine.”vii Krausse appeared poised to step into Kansas City’s rotation in 1966. After two multiplayer trades in mid-June that pared down the pitching staff, Krausse (age 23) and Paul Lindblad (24) became the oldest starters in a young mound corps. Thrust into the rotation, Krausse won five of his first six starts, and finished the season 14-9 with a 2.99 ERA, leading the staff in wins and innings pitched. Pitching coach Cot Deal’s assessment: “[Lew’s] an established major league starter … pitching awfully well.”viii Deal aided Krausse’s development by teaching him a straight change. The 1966 Athletics won 74 games, the most during their stay in Kansas City. Credit went to the pitching corps, because the offense mustered a near-league-low 564 runs. After the season the front office actively (though unsuccessfully) pursued a number of proven power hitters via trade, dangling Krausse among others as bait. Krausse remained with the team in 1967, and neither he nor the team approached the prior year’s success. Plummeting to last place — their third such finish in four seasons — the A’s narrowly missed another 100-loss campaign (spared by a postponed game). Krausse’s ERA mushroomed to 4.28 (league average: 3.23), and he lost 17 games while winning just 7. The 1967 campaign was played against reports of the club’s departure. Finley remained noncommittal, but the ever-weak fan base eventually quit altogether — attendance toward the end of the season averaged barely over 4,700, making the stadium a cavernous echo-chamber. Dysfunction was ever-present. On August 18 Finley told Krausse he was being fined $500 “for conduct unbecoming a major league player.”x This set off a chain of events that led to the firing of manager Al Dark (further evidence of Finley’s fickle nature: he rehired Dark at Oakland in 1974), the release of Ken Harrelson, and a $250 fine levied against pitcher Jack Aker. Krausse had been singled out for rowdiness on an August 3 flight from Boston to Kansas City. Krausse’s angry reaction resulted in an indefinite suspension. Although the suspension was lifted after four days, the A’s players issued a rebellious joint statement. Finley responded that “the entire matter was blown out of proportion,”xi Dark denied knowledge of the players’ statement, but evidence soon proved otherwise and Finley fired the manager. Harrelson followed with his comments, was released, and signed with the Boston Red Sox, whom he helped lead to the pennant. Aker (who as player representative was responsible for issuing the players’ statement) was conveniently fined for breaking curfew. Meanwhile, Marvin Miller, director of the nascent Baseball Players Association, lodged a complaint with Commissioner William D. Eckert and the National Labor Relations Board (because Finley was accused of coercion when attempting to meet with Aker and others to secure a retraction of the players’ statement). A September hearing mediated most of the differences and the Players Association withdrew its complaint to the NLRB. A second hearing dealing with Krausse’s fine and suspension was canceled when Krausse withdrew his appeal, but bitter feelings lingered. In the wake of these events, Krausse, Aker, and pitcher Jim Nash demanded to be traded. Tempers subsided through the offseason and all three reported to the A’s the next spring. Krausse didn’t get 20 wins, but his efforts contributed to the franchise’s first winning campaign (82-80) in 17 years. Former teammate Bill Stafford taught Lew an effective slider that helped him get his first complete-game victory since September 1966. Poor run support was largely responsible for his 10-11 record. Krausse started 11 games in which he yielded only 24 runs but came away with no wins. An offense composed of Reggie Jackson, Joe Rudi, and Sal Bando — the nucleus of future championship clubs — was better than years past, but sputtered when Krausse took the mound. His name was again tossed about in trade circles. The only reliever protected in the expansion draft after the season, Krausse watched as Aker and Diego Segui were selected by the new Seattle Pilots. A year later Krausse was bound for the same franchise. Injuries to the rotation made room for Krause, and this brought immediate dividends; he won five of his first six starts. At the plate, he hit four home runs. (teammate Blue Moon Odom hit five; their total was one more than the A’s catchers hit.) Krausse modestly claimed, “I’m not a very good hitter, so I have to earn my money some other way,”xiv but he actually possessed more talent than implied. The right-handed hitter was occasionally used as a pinch-hitter and, because of his speed, as a pinch-runner. That summer Krausse and airline stewardess Susan Wickersham announced their engagement, and planned to wed in November. A month before the wedding, the couple-to-be discovered that they would soon relocate. On October 10 Krausse and three teammates were sent to the Seattle Pilots. At first he said he would not report to Seattle, but had a change of heart when he perceived an opportunity to return to a full-time starter. As it turned out, his destination was Milwaukee. After an offseason of turmoil, four days before the start of the 1970 season the Seattle Pilots became the Milwaukee Brewers. Although the transplanted team would not cause Milwaukee fans to forget the accomplishments of Hank Aaron and Warren Spahn of the Milwaukee Braves, eager fans flocked to County Stadium. Krausse was the Opening Day pitcher and absorbed a 12-0 beating at the hands of the California Angels (a team he had had much success against). Krausse continued to take the mound consistently throughout the 1970 campaign, and pitching for the Brewers likely reminded him of his days with the A’s, as the club scored a near league-low 613 runs (the low of 611 was held by the new Kansas City iteration, the Royals). Krausse earned the Brewers’ first shutout, but many would-be wins were wanting due to the anemic offense, contributing to his team-high 18 losses, one shy of the league lead. He won 13 games, and he and fellow righty Marty Pattin (14-12) combined for 41 percent of the Brewers’ 65 victories. Other teams, especially the Angels, were interesting in trading for the 27-year-old Krausse, but no deal was made. Trade rumors persisted in Lew’s hard-luck campaign of 1971. A 2-8 mark in early June was hardly representative of his efforts as the team managed a combined 11 runs scored in the eight losses. Moved to the bullpen, he continued to thrive – a 2.08 ERA in 21 relief appearances. Meanwhile, he remained a highly-sought commodity as both the Minnesota Twins and the Los Angeles Dodgers pursued him vigorously, but no deal was made until ten days after the end of the season, when Krausse was traded to the Boston Red Sox in a ten-player swap that brought the Brewers some help to shore up their anemic offense. In his first start, Krausse got the win as the Red Sox defeated the Texas Rangers in ten innings (he gave up just two hits in nine innings), but he was less successful in subsequent starts and was soon relegated to the bullpen. His success in relief the season before with Milwaukee didn’t carry over to Boston – he had a 9.15 ERA in 17 appearances – and for the first time in eight years Krausse was struggling with control. When there was little perceived improvement the following spring, he was released. For the next three seasons Krausse bounced between Oakland’s Triple-A affiliate in Tucson and major-league stints with the St. Louis Cardinals and Atlanta Braves. In February 1975 he was re-signed by the A’s, but did not make the team. Lew returned to Tucson, where he worked almost exclusively from the pen. After a mediocre season (5.40 ERA, a run higher than the league average), and with no guarantee of a major-league job, Krausse at the age of 32 turned in his spikes and glove. During his career Krausse had dabbled in numerous ventures during the offseason: working alongside Danny Murtaugh and Mickey Vernon in a clothing store in Chester, Pennsylvania; dock work; real estate; selling season-ticket packages; and public relations for a Boston hotel. After leaving baseball, Krausse returned to the Kansas City region and operated a successful metal business. He was inducted into the Delaware County (Pennsylvania) Sports Hall of Fame. In 2010 Krausse returned to Milwaukee, where he and his long-ago batterymate Jerry McNertney re-created the first Opening Day pitch in the Brewers’ major-league history, 40 years earlier. When Krausse set down the Angels in his debut performance, many in baseball believed they were witnessing the beginning of greatness. These projections did not take into account Krausse’s control problems, but a short stay in the minors was expected to remedy this concern. Five years passed before he regularly donned a major-league uniform. His elbow injury likely slowed the youngster’s progress, but another issue may have played a part. Was this opinion accurate in determining what derailed the projections of unlimited stardom? The answer will probably never be known. Thanks for assistance from Frank May, president of the Pennsylvania Sports Hall of Fame (Delaware County Chapter). i “ ‘Silly Season’ in Big Time – Bonus Boys Rake in Chips,” The Sporting News, June 21, 1961, 25.
ii “Ol’ Doc Finley Tells Medics Just Where Baseball is Hurting,” The Sporting News, November 30, 1963, 18.
iii “Krausse Sets 20-Win Goal on Comeback Trail to A’s,” The Sporting News, April 25, 1962, 30.
iv “Medical Test to Determine Krausse’s Future in Game,” The Sporting News, November 10, 1962, 19.
v “Change-Up Put A’s Krausse on the Road to Success,” The Sporting News, March 18, 1967, 24.
vi “From Laggard to Lu-Lu – That’s A’s Krausse Tale,” The Sporting News, February 5, 1966, 24.
vii “Dark Talks Softly – A’s Listen Hard,” The Sporting News, April 2, 1966, 19.
viii “Krausse Clicks As A’s Starter; Change-Up Key,” The Sporting News, August 6, 1966, 11.
ix “It’s Fun Time If Moe Picks Up the Phone,” The Sporting News, June 11, 1966, 13.
x “What’s Next? Kaycee Fans Can Only Wonder,” The Sporting News, September 2, 1967, 16.
xii “Krausse Buries Hatchet, Leads A’s Pact Parade,” The Sporting News, February 3, 1968, 35.
xiii “’Hello, Job Corps, A’s Relievers Calling,’” The Sporting News, June 7, 1969, 10.
xv “Bosox Producer Kasko Casts Krausse in Long Relief Role,” The Sporting News, March 11, 1972, 32.
xvii “Cullen Top Pick To Collar Nats’ Keystone Berth,” The Sporting News, November 12, 1966, 35.